Fans of Salman Khan and Katrina Kaif are super happy to see this lovely pair back on the big screens. In these days the makers released different looks of Salman in Bharat. First we could get to see his aged look and then a young hunk. And now, the makers have released another amazing poster in which we get to see the gorgeous actress, Katrina Kaif. The new poster unveiled by the makers features Salman and his 'Madam Sir'. And the tagline makes it evident how happy Salman is to have Ms. Kaif aka Madam Sir in his life. 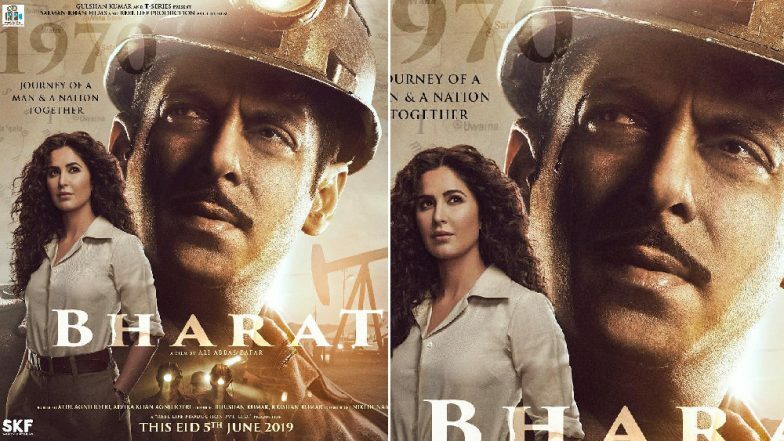 Bharat Movie Poster: Salman Khan Impresses in His Blingy Avatar, but Did You Spot Disha Patani in the Background? – See Pic. While sharing the poster, Salman Khan captioned, “Aur phir humare zindagi mein aayi 'Madam Sir' #KatrinaKaif #BharatKaJunoon”. Katrina Kaif’s curled hair look, makes her look gorgeous. This picture highlights the 70s era. The poster also shows Salman Khan working for a coal mine and Katrina as his boss. The duo is undoubtedly looking stylish, but we just can’t wait to see them together in the film. Katrina’s looks from the sets of Bharat had already taken the internet by storm and with this poster, we are sure fans are super excited. Bharat: Salman Khan Looks Equally Charming as an 'Old Man' and We Bet You'll Agree With Us - View Pic. Bharat directed by Ali Abbas Zafar is slated to release during the time of Eid this year. The film also stars Tabu, Disha Patani and Sunil Grover in key roles. So, what are your thoughts about this new poster?